"I'm your huckleberry, that's just my game." For reasons that will be apparent in a minute, that movie and that phrase has been on my mind over last week. So I did a little research into what the it was actually supposed to mean. I found THIS PAGE of research done by a fellow who advises for the Oxford English Dictionary. Basically back in the mid to late 19th Century the phrase “I’m your huckleberry” meant “I’m the right person for the job.” So I wasn’t too far off in my usage, and "the right person for the job" fits so much better to the way I'm thinking about it now. I handsaw all of my dovetail joints. 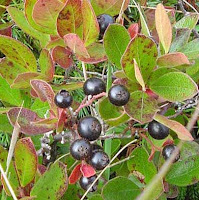 I have tried all kinds of saws in my search for the right “huckleberry,” and I have always found something I didn’t like or had to modify to get a saw to perform up to my standards. When it comes to dovetailing there are two things I have come to appreciate in a good saw. 2) I like a open handle western style design to the grip because I like the way it fits my hand, the control I get, and, sometimes most importantly, - it looks good. Seriously, an open handle on a dovetail saw just looks right. More than any other joint, dovetails have a drama about them, a theatrical soul that screams “look here…look at me!” It seems natural to me that the saw that helps create them should reflect that same spirit. Open style handle made in poplar to replace the handle that came on a Japanese style pull saw. 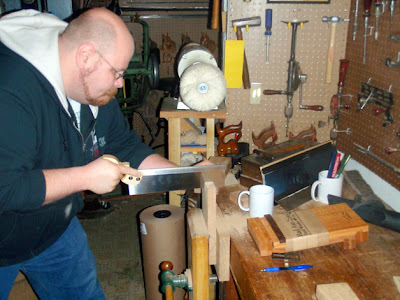 One evening, while having a few beers with a neighbor and fellow saw-degenerate Mark Harrell of Bad Axe Tool Works, and he let slip that he was in the process of designing some open handle dovetail saws. Now, if you talk saws with Mark for even five minutes you will find that there is likely nobody on this earth more knowledgeable about the factors that go into what makes a saw work and work well, and if you’ve ever had the opportunity to use or own a Bad Axe Saw then you know that knowledge and obsessive attention to detail result in a saw that is an experience to use. When Mark said he was working on open handles, I knew I this might be the best chance I could ever have to find my dovetailing huckleberry. Now if I had my way, I’d own one of everything than Mark makes, yes I consider him a friend and we swill some beer together on occasion, but I really do believe in his products and process, where else can you go to have one craftsman, just one guy working out of his shop, build you a saw to your specifications. Focused 100% on your order as he puts the pieces together, hand sharpens and sets the teeth, then takes it for a quick test drive to make sure it lives up to his high standards before he ships it to your door. Mark is creating a product that hasn’t been available in a “new” out of the box form probably since the hand tool haydays of the early 1800’s. Where else can you go and get that these days? Unfortunately, as a family man raising three kids in this day and age I cannot afford to indulge myself the way I would like and I am forced to strive to get the most bang for my hard earned buck. Here’s where the saw Mark has nicknamed Wyatt Earp comes in. Mark calls "Wyatt" a hybrid dovetail / small tenon saw. This just screamed versatility from the get go, and versatility is exactly what I look for when I’m making an addition to my shop. The more jobs a tool can do, the more valuable it is to me. The other day I got the opportunity to give that versatility a test drive. I have an old Disston backsaw with a bend in the saw plate I picked up at a flea market. I know how to remove rust and I can sharpen it myself but straightening the saw plate needed the touch of someone like Mark. I sent him an email and asked if I could just drop the saw off at his shop. “No problem,” he said, “Come on by." When I got there he said, “Hey come on down to the shop...I’ve got something I want to show you.” Well how do you turn down that? 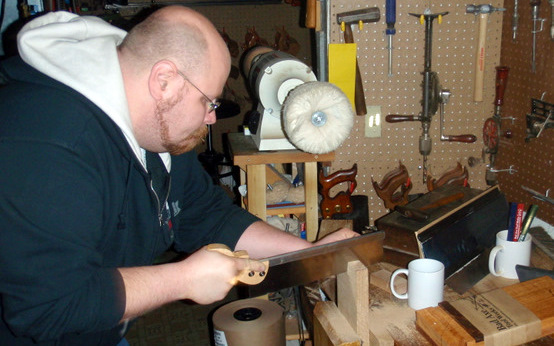 I followed him down the stairs into what I've come to call his “Saw Dungeon,” he clamped a chunk of 6/4 white oak into the leg vice of his bench and put the prototype of "Wyatt" into my eager hand. I went to work cutting dovetail cuts and immediately knew I made the right choice when I had placed the order weeks before. A while back I made a flip statement on Twitter that I was having a good time cutting dovetails in the shop that day. Shannon Rodgers of The Renaissance Woodworker Hand Tool School answered and teased that I should try cutting them in white oak and then decide if I was having fun. Right away I felt compelled to check over my entire shop to see where the spy cameras had been installed, because I was cutting them in white oak that day, and I was having a tougher time of it than usual. Now I stood at the workbench at Bad Axe Headquarters and that exchange came back to me as I was plowing thorough 6/4 white oak to an inch or more depth in 5 to 6 strokes. When I was done cutting four or five cuts I absentmindedly rubbed my fingers over the backside of the cuts, certainly expecting there to be tear out. After feeling for it I had to hang my head over the board to look and see, There was some small amount of tear out but hardly enough to think abouut much less mention. Down in Mark's Saw Dungeon Giving "Wyatt Earp" a workout. Even though the saw was filed rip for the tails mark gave me the bench hook and another piece of oak and asked me to try crosscutting with it. I gave him the eye like “really” but went to it. If Mark wanted someone to saw then I’d be his huckleberry. The cut was smooth and regular, there was minimal tear out on the backside of the wood. In fact if I hadn’t already known the saw was filed rip, I wouldn’t have guessed it. As I said before versatility is so important to me and this saw fills that ticket fully, When I want to travel light to an installation/repair, woodworking class, or demonstration, I’ll be able to pack one back saw for most of my needs. But Mark was not through grabbing my attention. He pulled out a shorter 10” dovetail saw, also with an open handle, and put it in my hand. I looked closely at what he’d given me. “That’s a very fine toothline.” I said. Mark nodded “Yup, 16 ppi.” He answered. I started on some 4/4 cherry, and eventually went to some 5/4 white oak, again I put the saw through all the paces Mark and I could come up with. including crosscutting with the rip filed teeth. The experience was totally different than all my other experiences with a high ppi saw. I started working with it biased to dislike it and in no time it won me over. Mark said he was thinking about nicknaming it "Doc Holiday" as a complement to the larger "Wyatt Earp." I didn’t really make the connection right at that moment but later on, as I spent the rest of the day working in the shop, and even later on at the dinner table with my family, I was still thinking about "Doc." I still feel that my order of the larger “Wyatt” was the right place for me to start, but I can think of so many instances, especially recently, where I would have reached for the “Doc Holiday” instead. I started to revise my opinion that I could live with only one dovetail saw. Either by accident or by sheer evil genius, Mark has really had found something here with the balance between these two saws. Even though they are great saws individually, paired together they can accomplish so much more. 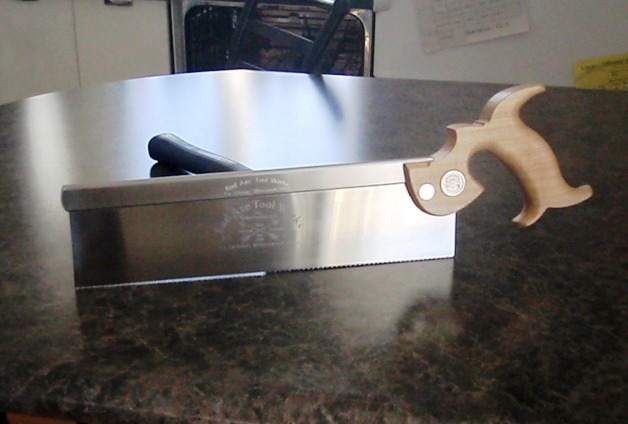 The 12” “Wyatt” is a fast cutting saw whose longer plate makes it perfect for cutting thicker stock, say 3/4 or 4/4 and up. But there are times your designs call for cutting small dovetails and joinery in thinner stock, say 1/4 up to 3/4, and here’s where the 10” “Doc Holiday” can make sweet. I can see myself reaching for Doc when I need to cut dowels for drawboring or smaller square ebony stock for Greene & Greene reproductions. A good read and yes it most definitely sparked my interest. Thanks for the history lesson and feedback on the line of saws. Those do look nice. I have gone through a saw conversion myself. I have pretty much sworn off of Japanese style teeth and have reverted to western style saws. I have a few Japanese blades remaining but as they give out, I won't replace them. I found the Japanese style saws very easy to learn with as a beginner. I especially liked using the no set / flush cut saws with a shop made plywood guide to help learn repetition when I was teaching myself to cut dovetails. Later on deciding to "experiment" by adding some western style handles to my Japanese saw blades was an epiphany in control and repetition. suddenly I didn't need those guides any longer. it's been a journey thats for sure but I can only think of one Japanese style saw I will probably continue to keep around and that's a small one of the flexible flush cut variety. Other than that I'm with you.